Back to my grey skinny jeans, and only because I wanted to wear them in combination with this excellent and comfy knitwear that I received from Tellstyle.com and my colorful DIY necklace. Probably some of you saw already a photo of the wonderful wrapped box on Instagram. How great is this sweater shaped as a sweatshirt? My answer will be: a perfect mix! Love the colours with the otherwise muted outfit! Nice touch with the skinny jeans left open at the ankles! That bag is to die for ! Love the whole outfit ! woahhhh check out the neck piece. It is outstanding! Absolutely love it! Such a great look. Love the sweater and that necklace is awesome! I love the color combo in your outfit. The yellow is a perfect compliment to all those neutrals! the jeans are so cool! and i love the necklace! Wow that necklace is amazing! your necklace is amazing! and I love your yellow coat! Love these colors combined together! 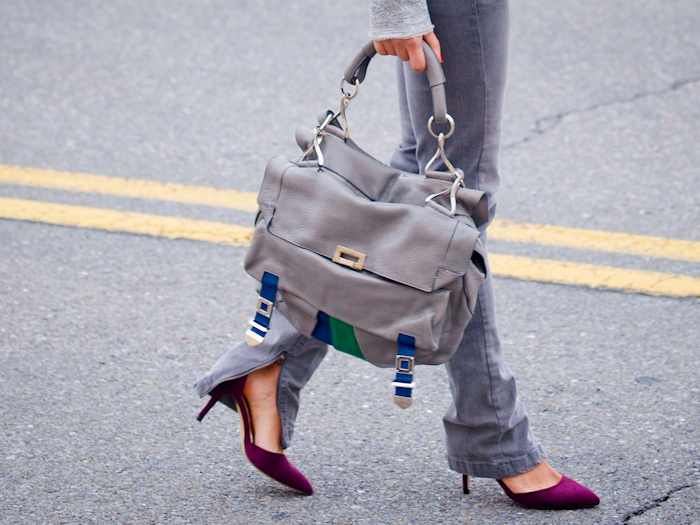 And those purple heels look great with the grey jeans. I have the similar ones in black! Still thinking about buying another pair in burgundy. That necklace is crazy (in a good way). Is it heavy? I love how all the colours go with the neutral greys. 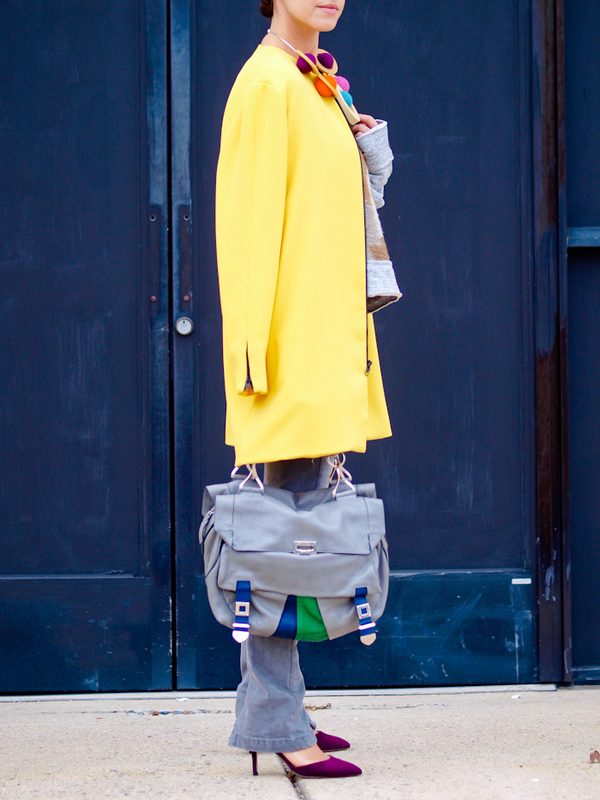 Grey and yellow look perfect together. Love the necklace and bag! gorgeous ! like your coat ! This is the most perfect necklace I have ever seen :D :D Soooo cool! You are the master of DIY jewelry!!!! Always fresh and funky! the necklace is such an art piece!! Only a true fashion icon such as yourself could come up with such an inspired and unique look! Excellent.